Since I'm a big-time designer now (ha, ha, ha), I've sprung for some design software. A little while back, I purchased Intwined Pattern Studio. Intwined is a relative newcomer to the knitting software scene, but it's also at a much lower pricepoint than its biggest competitor, Knit Visualizer. Nearly every piece of software on my computer came with it or was downloaded (legally) for free, so it takes something special for me to pay for software. And was I satisfied with it? Yeah, pretty much. Intwined has a huge library of stitches, and you can create your own as well. You can either work with Intwined's stitch elements (say, to create a unique cable symbol) or you can import your own stitch image. You can also change the existing stitch images, if you like your purls as dots instead of lines, or you have your own decrease symbols you prefer. Charting is mostly painless with Intwined - you can very easily add or remove rows & columns in the chart with keyboard shortcuts, and you can fill areas with stitches with the click of a button, or 'paint' them in individually. It's easy to configure your chart for flat knitting, round knitting, or lace knitting (= skipping every wrong side row). It's a thousand times more powerful than the java applet I used to use for charts - so it's very, very worth the money. My charts look better than they did before, and they're easier to edit, AND I can keep all the charts for one pattern in one file (Intwined projects use their own .kit format which includes any number of charts and a meager word processor for writing notes and instructions). There are some issues with the software, but every program has its bugs and missing features. It's not perfect - the border tool is wonky, the key is impossible to edit without a graphics program, some of the symbols or descriptions are wrong (it seems to have been developed by programmers, not knitters, and the in-house knitter only looked over it and okayed it). It tries to market itself as an all-in-one pattern creator, but the word processor is extremely lacking and it's much easier to just copy things into OpenOffice or Word and format it from there. At its heart is the charting component - I wouldn't lay a whole pattern out in Intwined, but I will continue to chart with it because that's what it does well. Support is okay. They have a fairly active group on Ravelry, though the staff has had a change and some family issues recently so most of the activity is users helping users, rather than programmers helping users. I haven't had any serious problems with the software yet, so support or lack thereof hasn't been a real issue. 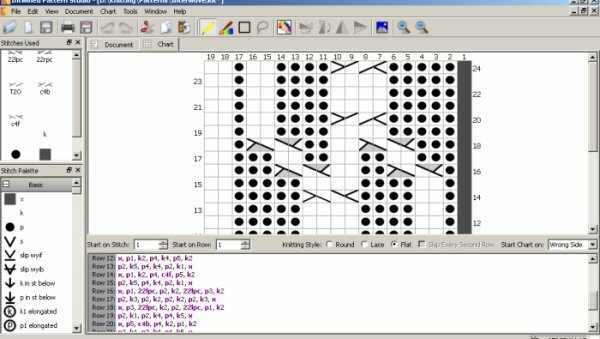 Intwined's not perfect, but it's a cheaper alternative to Knit Visualizer with most of the same functions, makes nice-looking charts which are reasonably customizable, and makes charting so, so much easier than it was before. Hi can you use this software for crochet? I want to make a afagan with pictures on it. Will Intwinded make a intarsia chart? 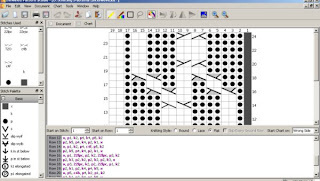 Sure, it has features for color knitting (though I haven't used them much myself), but I think it would be just as easy to do so in a program like Excel.